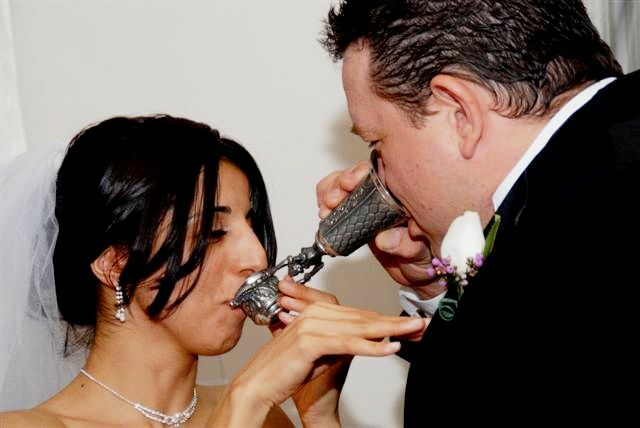 My son Michael and Diren, his new bride, using their “wedding cup” in the appropriate manner. I DO NOT DO VALUE ($$$’s) APPRAISALS. There are way too many variables: condition, location, time of year, present trends in stein collecting, local (and now national) economics, never seen before (therefore no comparables); but most of all = prior expectations by the owner, are among the reasons! 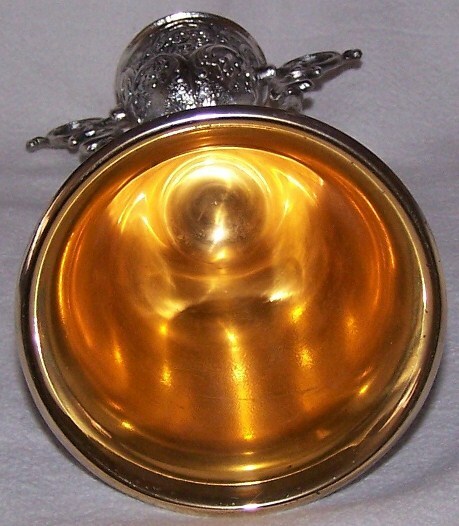 Very unusual all brass wedding cup by Hechert, or most likely his metal supplier. These usually have glass bottoms (see far below ▼ ▼ ▼) 8.8 inches. Centuries ago, in old Nuermberg (the old spelling), the nobel mistress Kunigunde fell in love with a young and ambitious goldsmith. Although Kunigunde’s wealthy father (a powerful nobleman) did not approve of this pair, it was clear that she only wanted the goldsmith to be her husband as she refused many titled and rich suitors who asked for her hand in marriage. Her father became so enraged that he had the young goldsmith thrown into the darkest dungeon. Not even his daughter’s bitter tears would change her father’s mind. To her father’s dismay, imprisoning the young man did not end his daughter’s love for the goldsmith. Instead, he could only watch as his daughter grew paler and paler as a result of the separation from her true love. The wealthy nobleman reluctantly made the following proposal: He told his daughter, “If your goldsmith can make a chalice from which two people can drink at the same time without spilling one single drop, I will free him and you shall become his bride.” Of course he was certain nobody could perform such a task…Inspired by love and with skillful hands, the young goldsmith created a masterpiece. He sculpted a girl with a smile as beautiful as his own true love’s. Her skirt was hollowed to serve as a cup. 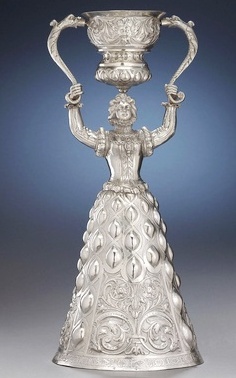 Her raised arms held a ‘much smaller cup’ that swivels so that it could be filled and then swung towards a second drinker. 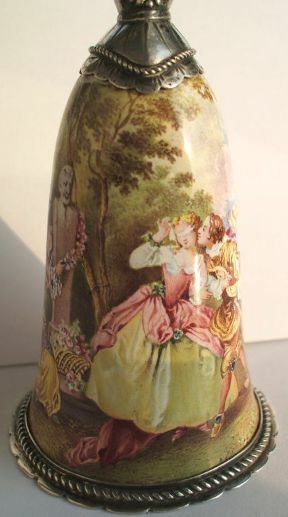 To this day to many couples, the “Bridal” or “Wedding Cup” remains a symbol; love, faithfulness and good luck await the couple who drink from this cup. Editor’s note” The very cheap, newer, not even silver plated examples of these wedding cups are shown at the very, very bottom of this page which I think is where they should be in one’s collection of drinking vessels, if one ven wants to waste the money! [L] An older (but marked .800 / crescent & crown), silver wedding cup from Germany. Circa 1900. Only 3.5 inches tall.They still make these in great numbers. The faces are not well done. 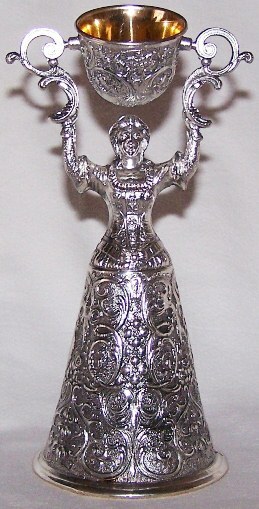 [R] Dutch .835 silver- a whopping 4 inches tall Ca. 1900. German postage stamps showing a wedding cup. 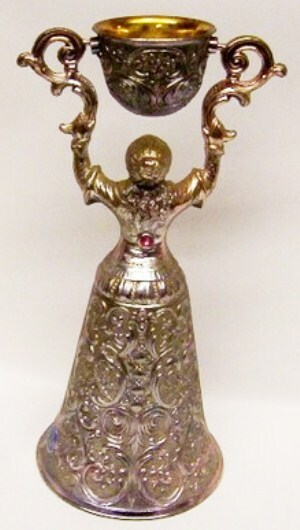 As I said, the real silver or good pewter versions are very much still treasured and in use today. [L] “Constance”, 7.5 inches. [R] “Florence”, 7.5 inches. [L] “Saskia”, 7.5 inches. [R] “Brunhiulde”, 7.9 inches. [L] “Adelgunde”, 7.9 inches. [R] “Augusta”, 11.5 inches. 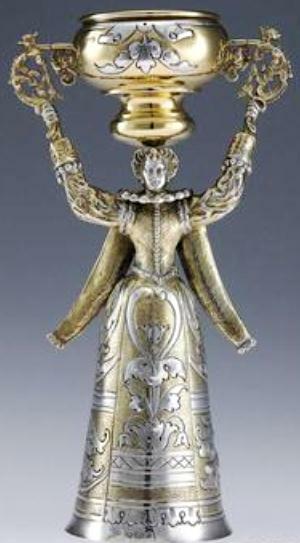 Silver wedding cups from Nurnberg are so popular they even make enameled spoons for tourists or part of a wedding celebration. 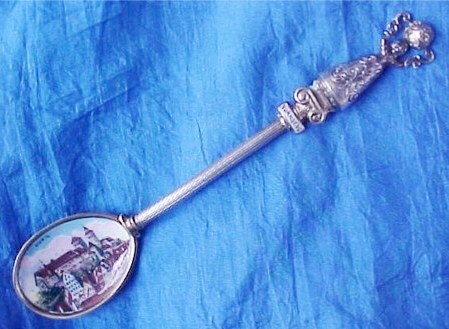 Detail of the very miniature Wedding Cup as the spoon’s finial. 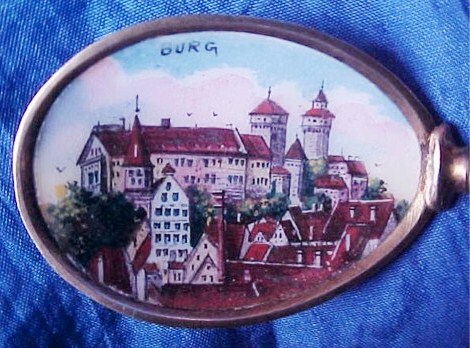 Detail of excellent enameled work showing the Old Town of Nurnberg. 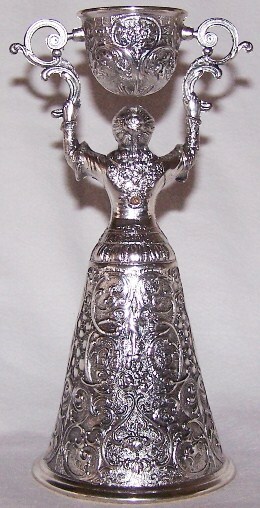 A very unusual style silver “Wedding cup”, but definitely not a “Jungfraubecher.” 4.5 inches. Called 1700’s by the seller on eBay. 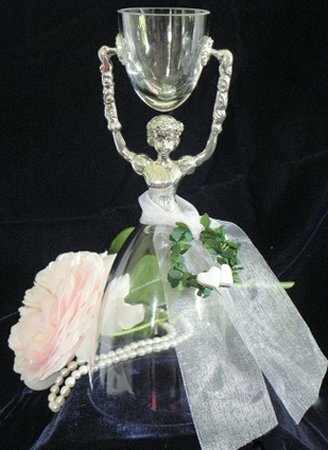 A miniature 3 inch tall wedding cup. It has been rumored, but never substantiated, that these little gals were presents to the wedding party. 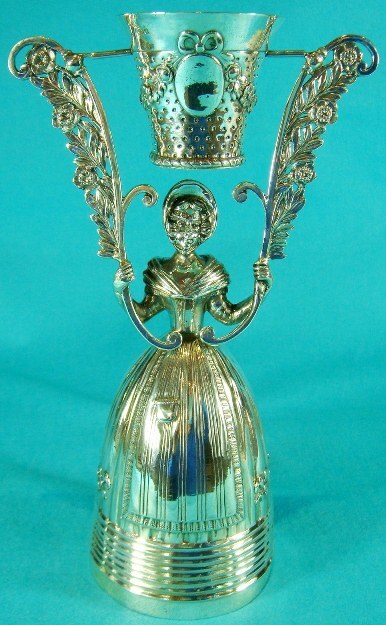 This cup is larger than most It stands 8,5 inches tall, 3 inches wide at base. A very interesting design variant. Seldom seen! 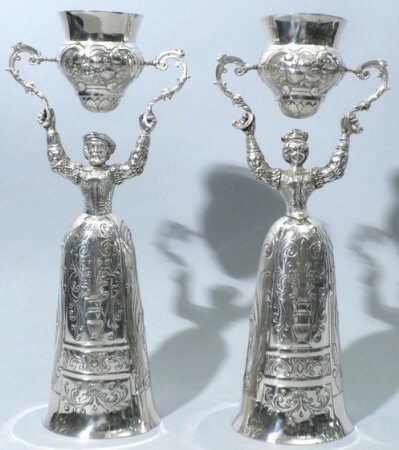 A pair of .800 Silver, German wedding cups, Circa 1900. I like this idea of the matching male, rather than the “stand” in the photo below. 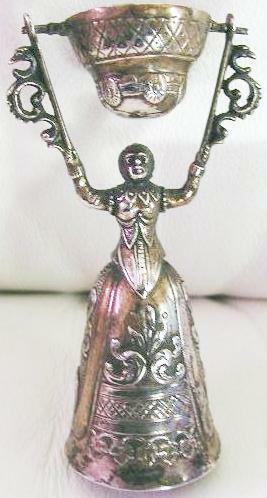 A scarce and interesting pair of cups done in .800 silver bodies and (carved?) ivory faces. When found (ha! – ever heard of that “Blue Moon?”) these can be very expensive. ( A pair sold in Pennsylvania in late 2011 for $16,100. And remember it takes two to go that high! 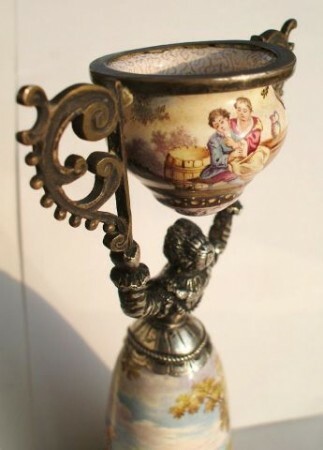 A tall, 14 inch, .800 silver German wedding cup that was for sale at “Rau’s” in New Orleans, for only $9,675.00 (the last price advertised in 2008 ) I would estimate this is mid to late 1880’s. 7.5 inches tall. Signed Heckert. These glass wedding cups came in a “multitude of designs!” Most were decorated in Germany by the Heckert firm, although most are called Moser by eBay sellers. The brass bodies, some gold plated, almost always the same design with slight variations due to height, were supplied to him and others decorators from an unknown firm. And for those that can afford the very best! = Enameled on copper. 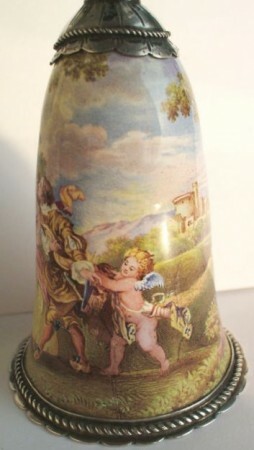 A 6 inch tall, beautiful hand enameled on copper wedding cup. Silver body mounts and bottom rim, bronze or copper upper cup holders. Vienna, Circa 1850- 70. Details of enameled body scenes. 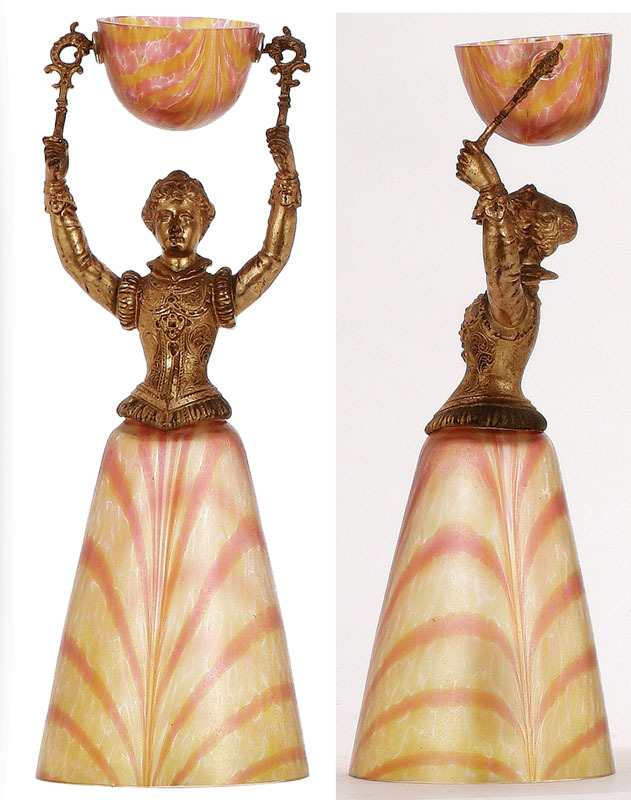 Detail of the enameled top cup and the bronze / copper holders. 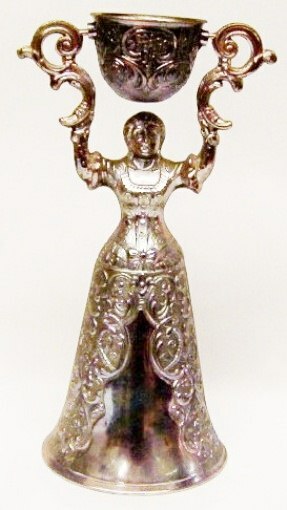 Very modern – 7 1/2 inches tall. Once upon a time, around 1450, there was a goldsmith who lived in Germany. This goldsmith was renown throughout the land for two things. The first was his incredible skill as a jeweler and the second was the exquisite beauty of his only daughter. She was acclaimed to be the most beautiful woman seen in generations. The goldsmith planned to marry her off to the wealthiest noble he could find to insure prosperity and a good name for himself and his family. Now, living with the goldsmith and his daughter was the goldsmith’s apprentice. He was a hard worker and blessed with much talent in the shaping of metals. A young, handsome lad be he and, as in the way of such tales, the daughter did fall in love with him. The two did swear secretly to wed none but each other. When the goldsmith did learn of their troth, he flew into a rage. He sent his daughter to a convent, forbidding her to even speak to a young man. Then, he cast the apprentice from his home and struck his name from the list of employed apprentices in the town. Tirelessly the young couple did work throughout the six months. At the end of that time they did present to the goldsmith a cup very similar to the one you are now holding. 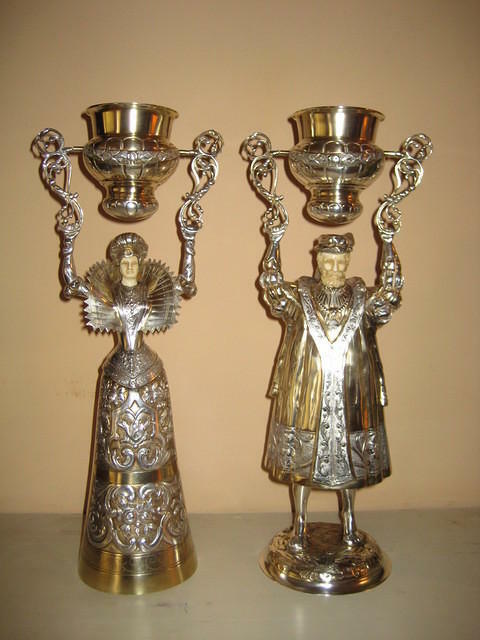 The man drinks from the base and the woman from the top..
BELOW ARE EXAMPLES OF MODERN, NOT EVEN SILVER PLATED WEDDING CUPS, MADE IN JAPAN THAT DON’T WARRANT BEING SHOWN WITH THE OLDER NICER ONES FROM GERMANY AND ENGLAND. THE ONE’S WITH THE STONES ON THE BACKAND THE SMALLER VERSION ▼ WERE SOLD UNDER THE NAME OF “ROGERS SILVER COMPANY”, I SUPPOSE THAT A “TAKE OFF” ON THE NAME OF THE ORIGINAL USA FIRM OF F.B. ROGERS SILVER CO. – EST IN 1883 IN SHELBURNE FALLS MASS. Not even silver plated! The instructions that come wit the box say just to wipe it off and don’t clean it with polish . It is some sort of cheap plating with a silvery looking metal. 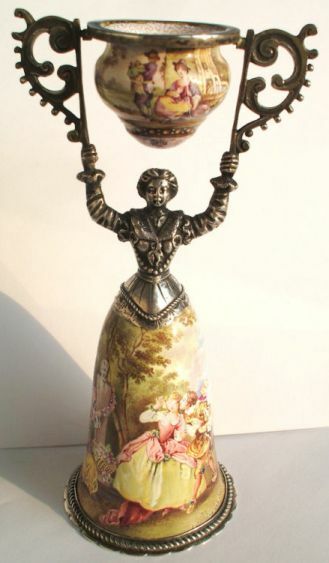 This was listed as a “wager cup” – which it is not -and certainly not worth anywhere near the US $339.00 that the Australian eBay seller was asking . These come in various sizes and all have some sort of fake gold wash inside both cups.. 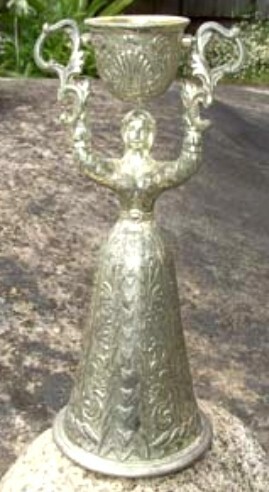 The largest version (about 8.25 inches) usually has a small pink, yellow or blue stone embedded in the curve of her back. Lots of times this stone is missing and the seller is unaware of it or just neglects to call the defect. (If I can find an appropriate photo I will post it. Just did, as there were a bunch listed under “wedding cups . The range in starting prices show in a one day search and not “Worldwide” – just the USA, was in US $$’s: The highest one as shown above ▲ at $ 339; then: $160 / 140 / 125 / 59 / 50 / 53 / 25 ………. and the best conditioned one was listed for only $15 to start! The smaller version at 7 inches tall had the following for starter prices: $75 / 55. Have fun out there folks ! ▲ Showing the pink stone in her back. The original golden finish applied to these cup. This is NOT gold plating or vermeil ! The above two photos show the 7 inch variation cup. The front of the skirt was left open; for a possible engraved inscription? At about the correct scale the 7 inch is on the left, 8.25 in on the right. Notice the difference in the skirts. Same maker = Japanese!